McLellan, John G., and Oliver, Nicholas H.S. (2008) Application of numerical modeling to extension, heat, and fluid flow in the genesis of giant banded iron formation-hosted hematite ore deposits. In: Hagemann, Steffen, Rosière, Carlos, Gutzmer, Jens, and Beukes, Nicolas J., (eds.) 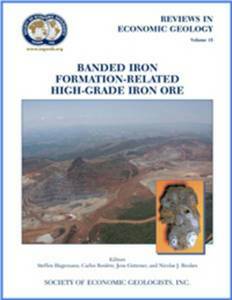 Banded Iron Formation-Related High-Grade Iron ore. Reviews in Economic Geology, 15 . Society of Economic Geologists, Colorado, USA, pp. 185-196. Finite difference modeling of fluid flow in response to topography, extensional collapse, and thermal structure has been employed to simulate processes leading to the genesis of Proterozoic iron ores, using input data appropriate to the Hamersley district of Western Australia and other iron ore districts. The geologic history and questions that provide the motivation for the modeling include the presence of a mountain range formed by pre-ore genesis convergent deformation, extensional collapse of that mountain range, and evidence at the deposits for two or more different fluid types, including a deep-seated (reduced) and a surface-derived (oxidized and 18O-depleted) fluid. In terms of fluid-flow rates, topographically driven downward fluid flow is seen to be comparable to both deformation-driven flow and also to heating and/or basal overpressures for comparable permeability structures and mountains with elevations in excess of 1 km. During extensional deformation at geologically realistic strain rates, downward flow is created by the combination of dilation produced by deformation with the inability of the fluid always to flow quickly enough to account for the dilatant volume change, producing areas of fluid under pressure, particularly across permeability interfaces. This effect is most pronounced where extensional faults cut through low-permeability basement. Upward fluid flow of heated fluids, as has been proposed to initiate genesis of these giant iron ore deposits, can be achieved at the start of extensional deformation if the deep fluid is initially overpressured, for example, due to input of fluids derived from magmas or to heating and/or devolatilization deep in the system. This initial upward flow can produce substantial temperature anomalies at relatively shallow depths, particularly in the hanging wall of dipping faults. However, with time, the extension and topography drives cooler meteoric fluids downward, which competes with and then eventually swamps the initial upflow. This scenario matches the envisaged sequence of events at the major deposits of the Hamersley district and also explains how different deposits record different degrees of preservation of the early-formed high-temperature assemblages, depending on the extent to which later surface-derived fluids have utilized the same structures as the initial upflowing fluid. Questions remaining from this modeling, and in consideration of the geochemical and stable isotope data, relate to which of the fluids (or both) was largely responsible for silica dissolution and whether both deep-seated and shallow fluids are prerequisite ingredients for genesis of this ore type.